Best Winter Sports Top Athletes Quiz game ever! Like playing some trivia and word game of “what pic” type? This is coming, the true game for real Olympic fans. This is not another game of this type, this is something more fresh. Nice high end graphics, icons and some features that can surprise You.You enter the app and think “hmm it’s really looks good, oh and what’s that?” Yes that’s awesome music in background with juicy beats! Go further, You play, tapping the blocks to reveal the pic of the athletes, trying to guess the name, and congrats You guessed! And what You see is another surprising. There is player profile with photo and some data : country, dyscypline, medals. Reveal the pic of the athlete and guess a name. There are athletes from multiply Winter Olympics disciplines. Prepare for 2014 Olympic Games by guessing as many athletes as You can. The titans of winter sports will clash soon in Sochi this February. With Guess Winter Sports Top Athletes You can master Your knowledge before and during the Olympic event. The Best is that each athlete You guessed has profile with info about discipline in which starts and medals achieved so far! You can learn a lot! Show how good You are and how many of Olympic Stars you know? 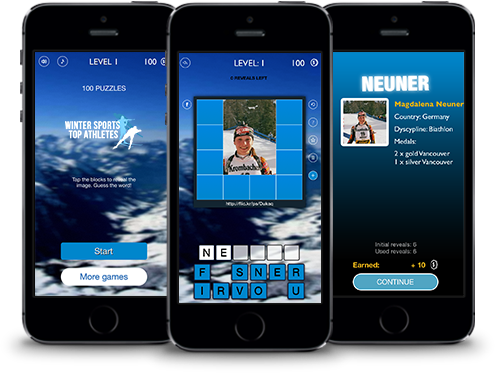 to share with the world so Winter Sports Top Athletes app can grow!